Legendary. Awe-inspiring. Steeped in rich Pacific Northwest history and built by hand to withstand the ages. The lodge guest rooms reflect the era of handmade furnishings and hand-painted artwork. This isn’t your average, run-of-the-mill ski lodge. Built in 1936 and declared a National Historic Landmark in 1977, Timberline Lodge is one of Oregon’s most popular tourist attractions, drawing nearly two million visitors every year. Considered an architectural wonder, it’s still being used for its original intent—a magnificent ski lodge and mountain retreat for all to enjoy. Timberline is home to North America’s longest ski season. In the height of winter, the ground floor of the lodge is typically fully buried in snow, with entry through a snow tunnel, or directly into the second floor. The lodge, combined with with its cozy rooms, pub, restaurant and resident St. Bernards (Bruno and Heidi), is a welcome relief after a full day on the slopes. There are not many places in the USA with genuine history but this is one of them. This place is incredible. From the minute we walked up the snow covered tunnel from the car park into the lobby we knew we were in a special place. The giant chimney in the centre of the lobby with 3 fireplaces in it sets the scene. You are essentially staying in a giant log cabin with phenomenal architecture and wooden carvings everywhere. We stayed in a fireplace room, one of only 8 in the lodge. Having a real log fire in your room while the wind howled around the building and the snow fell really made it feel like you were in your own log cabin. They provide you with earplugs simply because when the place was built soundproofing wasn’t even a thing. The wooden construction means the building creaks and groans while the wooden floors mean you hear the people above you. Freakiest thing is that they seem to have The Shining playing on a timer in the games/video room. So if you come down early morning don’t be surprised to see no one around and Jack Nicholson grinning at you insanely. we absolutely love timberline lodge. views as well as interior are one of a kind - just spectacular. food is excellent, the public spaces by the giant fires are amazing (perfect for a book and many hours of time!) and staff is helpful. the rooms are small but comfortable. (note: they are not soundproof.) we will definitely be back! 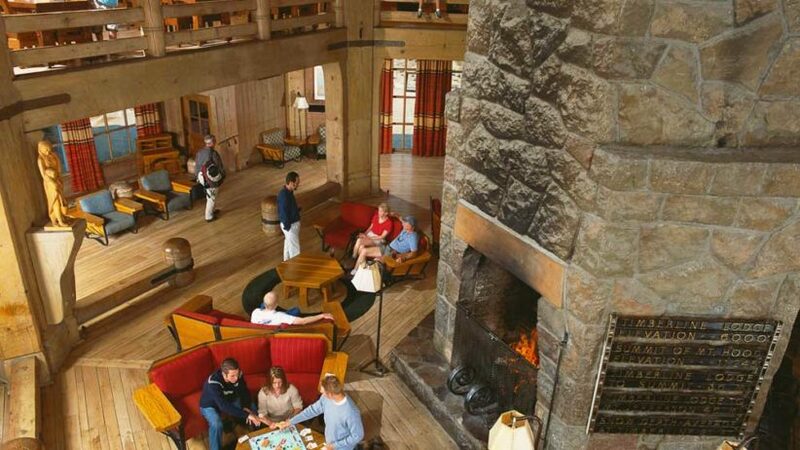 Staying at Timberline Lodge is a unique experience because it is a step back in time. One is surrounded by history. Did I arrive the day after President Franklin Roosevelt departed? Almost seemed that way. My room was clean and comfortable. Menus in the Cascade Dining Room were well conceived, and the food was excellent. The view from the dining room of the sun setting on Mt. Jefferson was spectacular.